After skiing 3 days in Tahoe before and on Christmas day with family, we sent the dogs back with the kids and drove to Jackson, WY as the first leg of a 3 resort trip. It’s about a 750 mile drive from South Lake Tahoe to Jackson, so it’s a full day. We were excited when we got to the high country of Wyoming looking at the tall snowbanks along the road — something we haven’t seen yet in Tahoe this year. Our first day of skiing was at Jackson Hole. The snow was great and other than the tram, the lines were not bad. We were expecting the worst due to the holiday and the fact that this was the area of the west with the most snow. Jackson Hole is an intimidating mountain, but AiRung handled it well and we were able to ski the major highlights in just one day. It was a rare bluebird day. The second day was Grand Targhee. We checked out of our hotel early and drove the 1 1/2 hours from Jackson to Driggs, ID and then back a few miles into Wyoming. 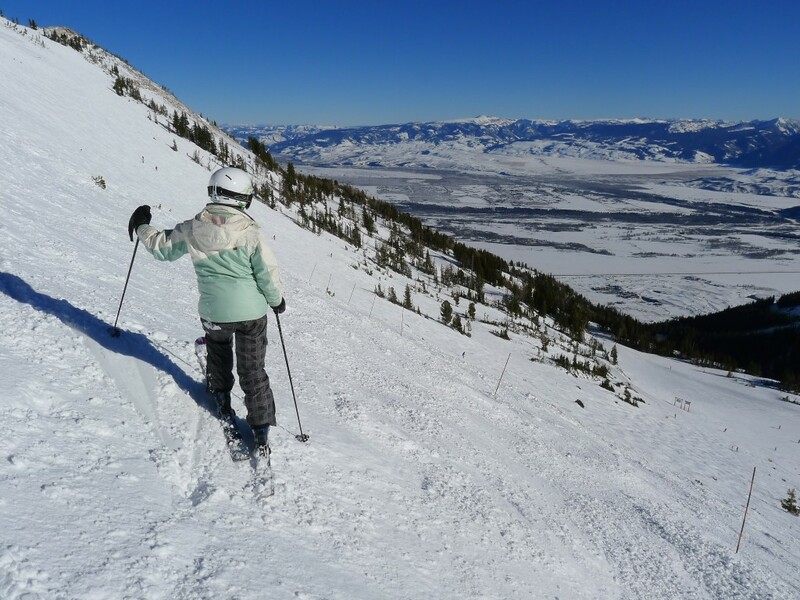 Grand Targhee is a much different place than Jackson Hole with mellower slopes and more snow. It was snowing lightly that day which was a pleasant change. We actually took a free mountain tour and had a great time skiing with the guide(s) and group all morning. After skiing Targhee we drove over to Ketchum, Idaho and the Sun Valley resort. After the deep snow at Targhee it was a bit of a shock to see the lack of snow in Sun Valley, but it turned out to be a really fun day. There is a full review here. I’ll get reviews up of the other 2 soon. This was a really fun trip, and we managed to knock off 3 resorts from the list, putting us at 33 of the 100. AiRung’s knee held up well after the surgery, although it was sore at the end of each day. Now we wait for snow in Tahoe. The Christmas skiing was pretty bad at Heavenly and Northstar with the ice and crowds. I don’t think we will do any more skiing up there until more snow falls. Let’s hope that’s soon! This entry was posted in Uncategorized on January 2, 2014 by Ron Thompson.